Many adult rescue dogs come with imperfect housetraining skills–or none at all–and even dogs who were potty trained in their previous homes sometimes need a refresher course if they didn’t get regular walks at the shelter. The good news is it’s fairly easy to teach an old dog this new trick. In fact, adult dogs are easier and faster to housetrain than puppies, especially if you use a crate. The key to rock-solid potty training is to start the day your dog comes home. If you stick closely to the following routine, you should be able to housetrain an adult dog within a week or less (though some pups need a bit more patience, and that’s okay, too). When you first bring home your adult dog, they will need to go out for midday bathroom breaks. If you have work, school, or other obligations that prevent you from being able to take your dog for a midday potty break, hire a dog walker. The first week or so is crucial in setting a new routine for your dog, and you want to avoid as many preventable indoor accidents as possible. If hiring a dog walker is not in your budget, ask a friend or neighbor to let out your dog in exchange for another service or favor. Crate training is the easiest way to teach a dog bladder and bowel control because dogs don’t like to soil their sleeping and eating areas. The crate should be big enough for your dog to stand up, turn around, and lie down in comfortably, but no bigger. If it’s too spacious, your dog may feel like they can eliminate in one corner and still keep their living space clean. Keep the crate in a high-traffic part of the house, so your dog won’t feel isolated. Also make sure to give your dog lots of time outside the crate for exercise, training, and just hanging out and bonding with you. If you keep them in his crate too long, they’ll feel trapped and frustrated. If you’re worried about putting your dog in a crate, keep in mind that, with adult dogs, you won’t have to use it very long–maybe as few as three days–before they’re fully housetrained. Most dogs actually enjoy having a safe, closed-off space for themselves to rest and recharge, so don’t worry too much about them feeling confined. They may even prefer to lie down there during the day, even when they no longer have to. 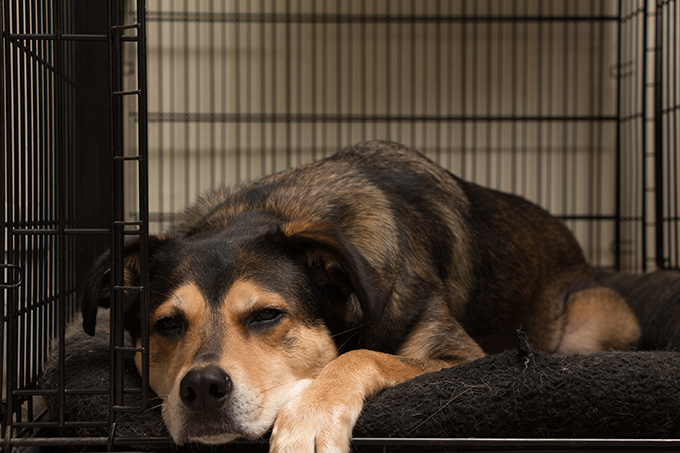 When using a crate to housetrain your adult dog, follow these basic guidelines to insure they don’t suffer from anxiety or eliminate in the crate. These steps will also help your dog understand what you want–for them to eliminate outside–and that they’ll stick to it. Never confine your dog longer than they can hold it. If they’re forced to go inside their crate because you didn’t let them out in time, you’ve made housetraining much harder. Use the same “elimination station” each time. 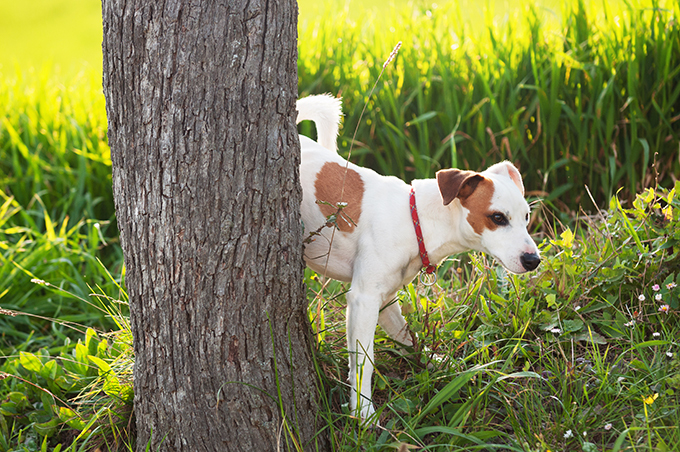 Dogs develop a preference for pooping and peeing in the same spots. Make it easier and choose, right from the start, the place where you want them to go. Don’t distract your dog with games and chit-chat; just stand still and let them circle and sniff. 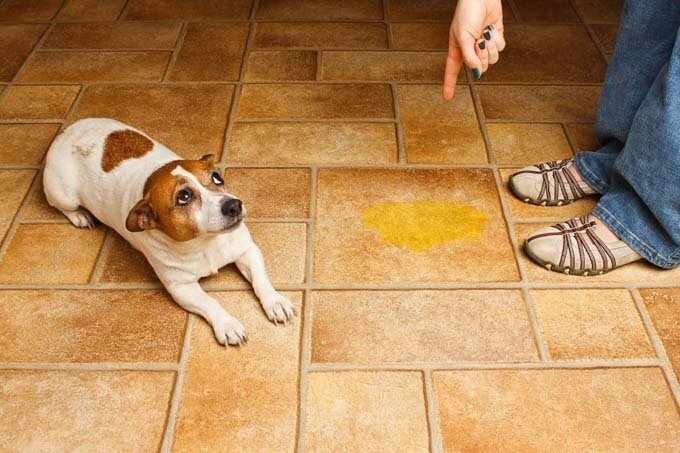 As soon as your puppy begins to go, give a command, such as, “Go pee” or “Do your business.” Before long, your dog will eliminate on cue–handy when you’re traveling or don’t want to spend walks carrying bags of poop. Shower them with praise when they do it right. Make sure the treats and praise come right after they finish eliminating. Make the praise enthusiastic and the food treat top-notch. You want to make it crystal clear that eliminating outside is a great thing. Don’t wait to get back to the house to give a treat; they won’t connect the reward with what prompted it. Don’t punish your dog for accidents you haven’t seen. Clean up thoroughly so they’re not drawn to the same place by the smell of residual poop or urine. If you catch your dog having an accident, startle them midstream with a shout or clap, then hustle them outside to finish. Praise them when they’re done so they learn that eliminating outside isn’t just allowed, it’s rewarded. You won’t always have to give your dog as many opportunities to use the bathroom, but until you have finished housetraining, you need to give your dog as many opportunities as possible to eliminate outside. Aim to take out your dog the first thing in the morning, before you leave for the day, twice during the day, once after dinner, and one more time before going to bed. Once you know they”ve got it, you can move them to four bathroom breaks a day–the standard for adult dogs. Also, take your dog for a walk or give them some playtime as a bonus reward. If they always come straight back inside after eliminating, they’ll learn to hold it to prolong their time outdoors. There will inevitably be an accident here or there while housetraining, no matter how closely you stick to a training routine. In the instance your dog has an accident inside, stick to these rules when picking out a cleaning product. Stay away from ammonia-based cleaners; they’ll smell like urine to your dog, and they’ll want to pee again on the same spot. Leave some soiled towels in your dog’s “elimination station.” The scent reinforces for your dog that this is the potty area. Stick with your training routine, and your adult dog should be doing their business where they’re supposed to in no time. Good luck! Have you ever housetrained an adult dog? What tips would you recommend for new dog owners? Let us know in the comments below!